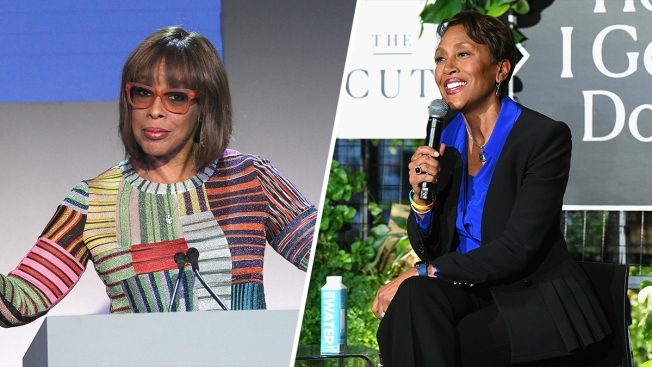 Gayle King (L) and Robin Roberts (R) in file photos. Different people have different reasons for asking that question — some valid, some not. But at the end of the day, the makers of news programs want eyeballs, and they're going to do everything they can to book the men and women who are making news. As two particular celebrity interviews conducted over the past month have demonstrated, even those who do all the comprehensive research and planning beforehand can never be sure of what they're going to get from the discussion— or what's going to happen a few weeks, days, or hours after the cameras are turned off. His interview with Roberts for GMA has been repeatedly referenced — either in detail or via photos of the two sitting across from each other — to reiterate the details Smollett claimed to be a factual account of what happened to him, which simultaneously stresses just how far his ruse extended, if it was indeed a ruse. Smollett is currently free on a $100,000 bond; his attorneys said they intended to "conduct a thorough investigation and to mount an aggressive defense." "It was hurtful, some of the things that were said [afterward]. I'll be honest," she said. "Because I pride myself on being fair. I know how much work went into being balanced about what to ask, to challenge him on certain things." After the charges were filed, Roberts interviewed Chicago Police Superintendent Eddie T. Johnson about the investigation that led to authorities becoming convinced the whole thing was a hoax. On the other side of that fickle coin, Gayle King has been praised for how she maintained her composure in the face of an erratic R. Kelly over the course of an intense, sometimes uncomfortable and entirely bizarre 80-minute interview for CBS News, portions of which aired on CBS This Morning and CBS Evening News this week. Naturally, there were pre-interview complaints about why the singer was getting such a prominent stage in the first place in the wake of the damning allegations laid out in Lifetime's "Surviving R. Kelly" — and after being charged with 10 counts of aggravated criminal sexual abuse (which couldn't be discussed because it's an ongoing case; he has pleaded not guilty). But the show was certainly going to go on, and — after the clips in which Kelly cries, swears and at one point stands and emphatically insists that he's the victim went viral — became a prime-time special, "The Gayle King Interview With R. Kelly," that aired Friday. All of which is exactly what happened. King's unfazed expression as Kelly rants at her and in general is the priceless stuff that memes are made of. The gist of the outcome, however — aside from Kelly entirely failing to convince anyone who already thinks he's guilty otherwise — is that Kelly denied the accusations against him and didn't waver from his own version of events. OK, so obviously King had a mountain of evidence and past legal allegations with which to confront Kelly, which made her assignment wildly different from what Robin Roberts was facing when she agreed, at first reluctantly, to interview Smollett. She tried to coax as many details out of him as possible, and short of asking him point-blank if he was lying, she broached the subject of there being perceived holes in his story. "The vast majority of people have been supportive and loving and understanding," Roberts said to him, "and then as time has gone on, and that there's no — you know, it's 2 o'clock in the morning, you're going to Subway, sub-zero [weather]..."
"Subway is open 24 hours," Smollett replied indignantly, adding, "people kill me when they say things like that." A few minutes later he said, "I will never be the man that this did not happen to." And toward the end, he declared, "You do such a disservice when you lie about things like this." So, both interacted with their respective interviewees appropriately, but because Smollett's case then devolved into a situation where countless supporters were appalled by the possibility that he lied and those people who didn't want to believe him in the first place were grotesquely overjoyed to have their suspicions purportedly confirmed by the police and prosecutors' conclusions, Roberts was somehow left holding the bag. As if she — or anyone else — was going to be able to pull a Perry Mason and command a dramatic confession — contrary to everything he'd said before — right then and there. King was able to approach the Kelly interview with less of a 360-degree awareness of how many people were personally invested in how she treated Kelly, but King was weighted with similar journalistic responsibility, as well as the urgency that comes with wanting to hold an alleged sexual predator accountable and, as Roberts stated in her case, get to and give the truth. "His team reached out and said he was interested in talking, and he was interested in talking to me," King told O. "I had some reservations because I was thinking 'What are we gonna get? He's just going to deny it!' But I did it because I at least thought there would be some...if not contrition, then at least acknowledgment that 'This is a bad situation, and I have made some mistakes.' But instead, he seems to believe everyone is out to get him...that everyone is after money or book deals or TV deals, and that even the parents of these women are lying. As you saw, he says he's only guilty of one thing: Having a big heart." Most people agree to grant interviews knowing ahead of time what they'll be willing to talk about. It's up to the interviewer to prepare, go as deep as possible and mine what she can, and ideally know the value of each nugget.